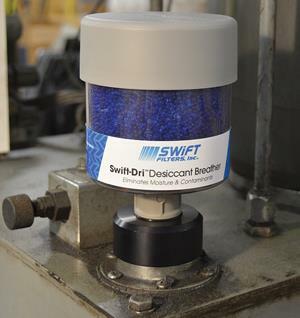 Swift Filters recently introduced a new line of desiccant breathers for industrial equipment. The new Swift-Dri breathers are intended to protect equipment from moisture and particulate that can be drawn into machines as they "breathe" during normal operation. As air contracts or expands, or as entering fluid displaces the air in a system, outside air is drawn in from the atmosphere. The Swift-Dri breathers are designed to block moisture and particles that may be in the air from entering the system. Typical applications are on hydraulic system reservoirs, gearboxes, diesel-fuel storage tanks and pumps. According to Swift, the Swift-Dri breathers can average nearly 20 percent greater moisture-retention capacity than other leading brands. The silica gel desiccant beads help to prevent harmful moisture in the atmosphere from entering the system and can also attract moisture already in equipment reservoirs during servicing or shutdown, keeping the equipment dry. Ten different models are available to fit systems up to 600 gallons. Optional check valve models can also be purchased to help isolate equipment from high-humidity ambient conditions and prolong the breather's life. Adapters can be added to allow connection to most equipment. For more information, visit www.swiftfilters.com.